Keeping up with Germany's Vanden Plas takes some work and patience. They've re-energized their career in the last few years by creating several metal rock operas, the latest being Everyman - A Rock Mystery. To the album and music at hand, they've been also collaborating with German sci-fi and fantasy writer, and fan of the band, Wolfgang Hohlbein to bring his Chronicles of the Immortals to life in music and theater. Chronicles of the Immortals - Netherworld II brings Andrej Delany's saga to a conclusion via Vanden Plas' epic progressive power metal. And that may be enough for any fan of the band or the novels to buy this album. And they should. As for the story, I won't elaborate and you can find more information elsewhere. As for the music, it's pretty darn terrific, everything you would expect from Vanden Plas. The band has that unique ability to take classic melodic heavy metal and make it sound profound and immense through ambitious, though not overly technical, arrangements. Most of that comes from large riffage and lavish keyboards working in rhythms and waves through each song. A Vanden Plas song becomes both symphonic and bombastic. But what really holds the songs together is Vanden Plas' inherent sense of melody and harmony. This is exquisitely brought out and carried along by Andy Kuntz's voice and vocal arrangements. Frankly, as much as I love their progressive power metal, Kuntz' voice has always drawn me into it. One of the best metal singers around, he's melodic, yet powerful, swelling with both range and emotion. But, of course, getting to another great thing about heavy metal, there's the equally powerful guitar solos that rise and roar in every song. Hey. 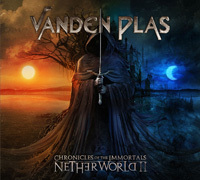 It's all good, Vanden Plas' Chronicles of the Immortals - Netherworld II is the perfect storm of progressive power metal, epic in character and an enjoyable listen. Easily recommended. It's all good, Vanden Plas' Chronicles of the Immortals - Netherworld II is the perfect storm of progressive power metal, epic in character and an enjoyable listen. Easily recommended.